Craftastical! : Dress one of ___? Isn't she cute? Dress one of ___? Isn't she cute? 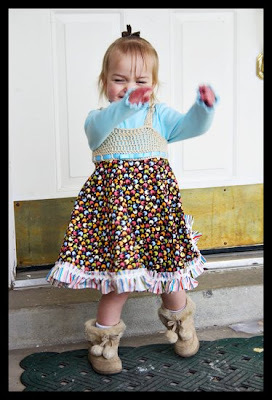 I've mentioned how I've been sewing dresses for Aubrey lately. This was the first one I did. I crocheted the top, then made a dress bottom to fit. I'm thinking about selling the pattern on Etsy, but is a lot of work to get a pattern ready so that someone else can follow it. I'm also almost done with a crocheted hoodie that I've been writing down as I went. I'm also in the middle of trying smocking for the first time, which is fab, but time consuming. Yikes! I'm planning on posting directions when I'm done, so if you have a burning desire to try it after I post my dress, you won't have to learn the hard way, like I did. There are not great directions on the web that I could find. I found the basic instructions in this booklet from my great-grandma. 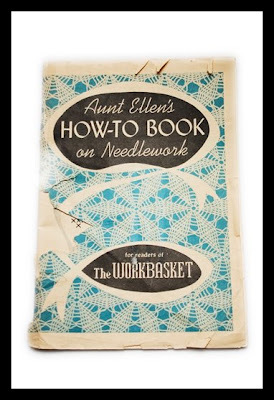 I plan on trying each type of needlework it describes. I've done crochet and smocking, but there are all sorts of cool things, like tatting and hairpin lace. And without further ado, the little goofball who is not only a horrible fit model (she won't stand still, she won't let me look at the things I need to see, she runs off with my half-finished projects), but she doesn't like to pose for more than a millisecond and we all know my reflects leave a lot to be desired. The skirt is nearly a full circle, so it has a lot of movement to it. She has a petticoat that she wears under it sometimes and it fluffs up nicely. But for errands today, she wore it without. She gets a lot of looks and compliments running around in her dress. She's just irresistable. Look at hat, she's standing! When did that happen, LOL! It's been a LONG time since I've seen her, I guess! I hear you about unwilling models. At least she will wear dresses when it's not a sunday. I tried to get Maddy to wear the one I made for her specifically for Valentine's Day and she would not hear of it since we weren't going to church. 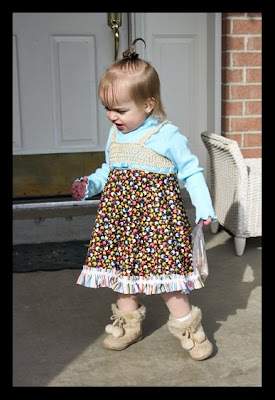 *eyerolls* Doesn't she know she's a girl and is supposed to want to wear dresses all the time??? I guess she'll be wearing it to church tomorrow instead.